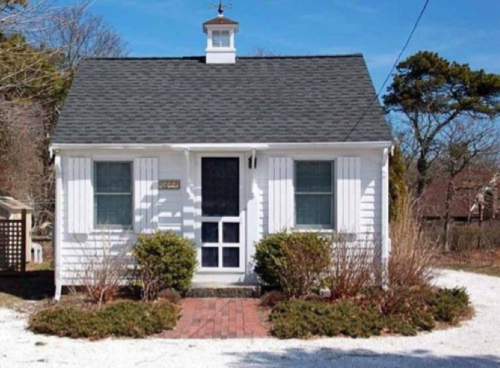 Tiny Houses: The Next Big Thing for Seniors? Many people downsize when they move to a retirement home. 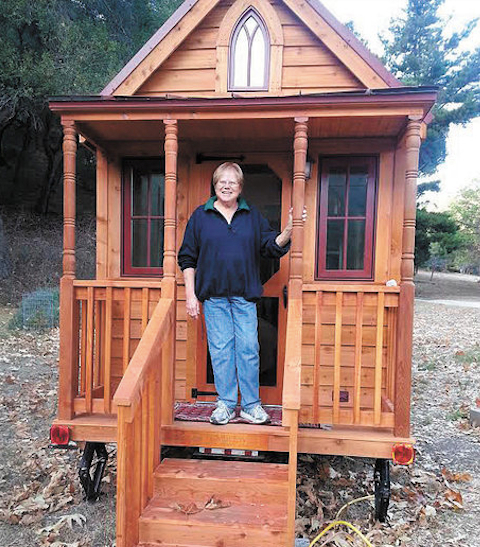 Bette Presley, 72, took that idea to an extreme last year when she moved into her tiny house – a 166-square-foot cabin in the small coastal town of Arroyo Grande, California. Presley’s home measures just eight by twenty-four feet. It has a built-in platform bed, built-in shelves, space for a narrow table and a loft that accommodates a queen-sized mattress for guests. Her tiny house’s kitchenette is outfitted with a built-in stove and oven, plus a sink and small refrigerator; in the bathroom are a tiny sink, a toilet and a shower. Presley heats and cools her home via a unit on the ceiling. Presley is part of the Tiny House movement, whose growing popularity reflects a desire among some Americans to pare down, consume less and enjoy a simpler, more customized home and lifestyle. While the houses are small – any home of less than 1,000 square feet is officially “tiny,” but most range between 100 and 400 – the trend is growing fast; as of last month, there’s even a tiny house TV show: Tiny House Builders premiered on HGTV on December 14. The Tiny House Movement’s growth is largely among the young and child-free, but it’s gaining momentum among seniors, too; some 40 percent of tiny house owners are over age 50. After all, what better time to downsize, personalize, simplify and save – either alone or by buying a plot with friends and forming a tiny house community? A finished build-it-yourself house averages around $23,000, and plans and kits are available online. To have a house custom built runs around $50,000-$60,000. That’s a few hundred thousand less than a tiny Manhattan apartment and an alternative to a Florida condo. Tiny houses are for sale in nearly every state and in general, tiny house builders will ship a completed house almost anywhere. Most tinies are located in scenic rural settings, but there are appealing micro-apartments and mini-houses for urban dwellers, too. 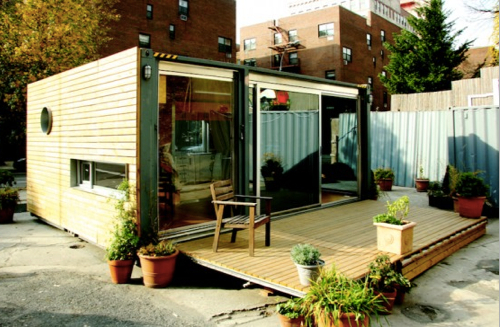 Currently the only tiny house showcase, Micro Showcase, is located in urban Washington DC (top photo), and in 2010 MEKA, a company that creates modular living solutions and ships them worldwide, dropped a 320-square-foot MEKA show home with a shipping container shell in the middle of NYC’s West Village. House styles are limited only by square footage and your imagination – super mod, industrial chic, rustic, luxe or any quirky mashup that suits your personal needs and aesthetic. Whatever the style, your house – like Presley’s – is likely to incorporate space-saving innovations in cabinetry, appliances and furnishings borrowed from the boat and RV industries. 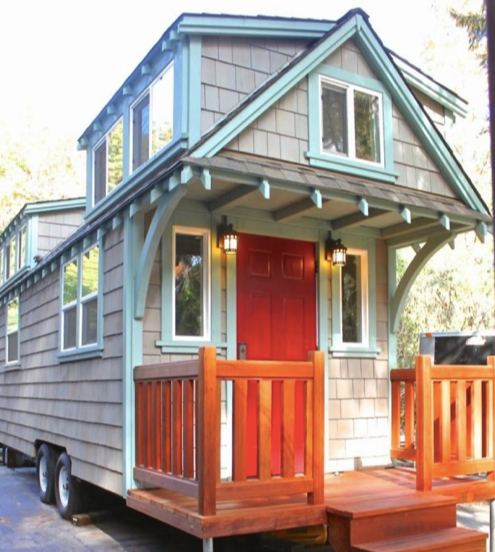 Although the company Tiny Home Builders has a Tiny Retirement design that does away with loft beds and ladders, we haven’t yet seen fully accessible tiny houses built with universal design principals, but these are surely coming. Cut your expenses and debt Costs of building or buying a home, utilities, taxes, repairs and maintenance all decrease. Sixty-eight percent of tiny-house dwellers have no mortgage. Have greater freedom Fewer possessions, greater mobility, more time (and money) to spend on favorite activities or traveling to visit family and friends, more time out in the community using resources like libraries, the local “Y” and gyms. Be adaptable A truly tiny house is mobile. If down the road you decide it’s time to live closer to family members, you can take your home and plop it in the yard, a ready-made granny-pod (of course you’ll need to hook up utilities). Reduce your environmental footprint Building tiny means less waste of natural resources, reduces energy and water use, and often uses high-quality green building materials. Grow better relationships People who share their tiny homes with a partner find that living in a small space breeds more open communication, understanding and patience. For some, going tiny is a way of living a more sustainable lifestyle. Going “off-grid” is an even more minimalist social movement to live self-sufficiently off the power grid. Did you know there are compostable toilets? Some tiny-house dwellers go solar or do without electricity altogether by using wood stoves or propane for heat, and lanterns or candles for light. It’s hard to downsize Not everyone is ready to cut way back on what they own. Will you be able to part with your keepsakes and heirlooms? 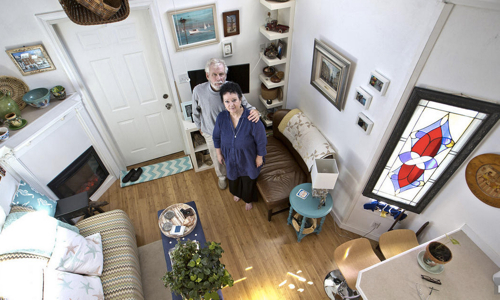 Codes and permits can be tricky Cities make less tax revenue from tiny houses, so they are not welcome everywhere; building codes vary from city to city and most tiny homeowners have a hard time getting city permits; in January 2015, seniors Karen and Tom Rogers won a board of zoning appeal in York County, PA to keep their 565-square-foot tiny house; the decision is being reconsidered. Tiny homes are frequently built on wheels and registered through the DMV as RV’s, semi-trailers or mobile homes, which don’t have to go through the same zoning or permitting process. Read more here. Lifestyle changes can be wrenching Want to try before you buy? Tiny house vacation rentals are available in most states and can be found with some quick online research. In July 2013, the first-of-its-kind Caravan Tiny House Hotel opened in Portland, OR, comprised of six tinies for rent individually or for groups of 20 if rented all together. A Tiny House for You? Featured Photo: Minim House, located at the Micro Showcase in Washington DC. I live in So/Cal near Long Beach and have toyed with this cash out and no debt for some time. I would love to have a mobile tiny house for travel. Something with senior accommodations in mind and not so heavy that you would need a monster truck to tow it. Where can I find out if one of these tiny homes can be put on our property for our parents? We live in Minnesota and I thought I heard that they were going to be passing laws about it – but can’t find any info. That will depend upon what city you live in! I’ve attached a link to rules for “accessory dwellings” in the City of Minneapolis, but each city will have their own codes — call your appropriate city office to find out! Which we sold to our son for half the price and the othe two remaking acres , gave to our daughter. We manage our sons home of mostly students. Next will be to create our unique tiny home and live on his land. Half the student rentals create an income for us and the other half pays the mortgage for him. We can use the house between May to August 31st. Spring in Europe (buy a cheap house) and home in the Fall to Christmas. Any good investment you make has good resale potential! That key!! The bonus in all of this is you are always home!!! My husband and I are having a tiny home build by the Tumbleweed Company it will be completed in October 2016. We are excited BUT we are having a very hard time finding a location to place the tiny home. The unit we purchased is considered an RV but the RV parks don’t want them either unless we want to move to Portland, they seem to be the only state that is excepting of the tiny house movement. If anyone has info about available land that they want to share with a tiny home that would be very helpful. Thanks! Generally I like the idea but a tiny house for me is anything under 1000 square feet, with full size appliances and inside laundry is a must. The people downsizing to what is a fancy trailer under 400 sq ft are taking “tiny house” to a level I don’t care to explore. I own an undeveloped city parcel, and cannot build anything less than 750 sq ft on it. Tiny homes are not welcome everywhere. 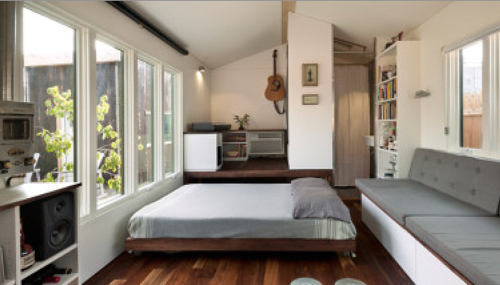 One thing that bothers me about many of these tiny house designs is the lofted bedrooms — I for one do not want to have to negotiate a ladder in the middle of the night in order to visit the bathroom! Sounds wonderful, but would not work for us. Hubs and I both are semi retired and work from home, for which we need space. Plus I like to accommodate grandkids and entertain over the holidays. Having said this, we downsized by nearly half of our old house space about 13 years ago. We still live in a spacious house, but it’s not anything like when our kids were still in the nest, and we had an au pair in addition to them. I like the concept but would not be able to live in one with my pets, art studio, my partner’ office (he works from home) etc. I try to streamline and simplify wherever I can and that is what I think this taps into–that we have too much stuff. Instead of us owning it, it begins to own us. For example I thought a food processor would make my life easier but it didn’t, pulling out a knife and a chopping board was much easier, and by far easier to clean. Living small makes us feel free of our possessions and free of those manipulations to buy more and more. One of my thoughts too—getting oId often means needing canes, wheelchairs, homecare nursing…having a tiny home built at such an old age doesn’t make sense. Without property to put it on and not wanting to live in RV parks, I don’t see it being economical. I wouldn’t live in one of those if they paid me. What a horrible way to live, like in a college dorm. Life is short. Why sacrifice? If you are poor and you have no choice, that’s one thing. The only thing, in my opinion. Get an RV instead. Sounds nice here, but if you’ve ever watched that Tiny House show on HGTV you know that many of those tiny houses do not have flushing toilets or any kind of proper indoor plumbing! That makes it a no go for me. dreaming of the day…when there’ll be safe, secure tiny house communities EVERYWHERE to choose from. coming from a place where crime and break in’s are all too common, security features are a more prominent concern. Anyone? Yes, very good point! Seems that these tiny houses and their communities are for the affluent, aging, hippy. Those that have access to large plots of private land where safety isn’t much of a concern. I would love the simplicity. The townhome in which I live is 937 square feet; it is considered tiny, per this article. I love it. It has 12′ ceilings, which gives it a much larger feel, but without the extra floor space. I have a enough living room to comfortably entertain a few friends, which is just fine for me as I don’t like being in large groups of people. It very comfortably holds a queen-sized sofa bed, a morris chair, another easy lounger chair, a large welsh cupboard, a few occasional tables, largish writing desk, printer/stand and small table that holds files. And there is plenty of move-about room. There’s a good sized bathroom, a good sized bedroom with walk-in closet, a dining area and small kitchen, which also holds a washer/dryer closet. What more do I want. Plenty of relaxing room, a small walled front yard and oh yes –a screened in patio that faces a magnificent Sonoran desert wash. The real pros –easy to keep up, less money to cool in the summer and needs very little heat in the winter, even on below-freezing nights. A few cons, especially downsizing from a much larger stand-alone home are, not enough storage space, especially in the kitchen; no room to set aside for art and crafting …. both have been relatively easy to adapt to. It’s large enough for a modest amount of nostalgia, memories and tokens from collections, and far too small for too much clutter to accrue. What more could I ask? your place sounds very similar to the co-op i have in tucson…i love it and it is plenty big enough!! I built a 400 square foot cabin on 5 acres at age 61 and lived in it 11 1/2 years. It was great. Thanks for the insightful article on tiny houses. I downsized five years ago and believe I’d be very comfortable in 500 square feet. Don’t think I could adjust to less. Very cute designs. looking for the right community. Price can be an object. Location, maybe. Are the Tiny homes safe and secure? Reminds me of the story of The Three Little Pigs, “I’ll huff and I’ll puff and I’ll blow your house down”. Can they with stand severe weather and break ins. The article does not focus on this concern of security. We own a 398 sq foot park model Tiny House and we are retiring this year to live in it full time. It’s an open plan, has 2 lofts, a full bath, full bedroom and we built a 12×28 foot deck and since our lot foot print is small, we used artificial grass to make the exterior maintenance free. Not bad and we can entertain up to 10 people comfortably inside our place. Sounds great, but I really am getting concerned as tiny houses started at $600, now Im seeing $300K, with an average cost of a home when we were younger adults. WE GOTTA GET CAPITALISTIC THINKING OUT OF THE TINY HOUSE CONCEPT. People have to learn that if they bring their capitalist thinking into the concept, it will totally destroy this option for our kids and grandkids who are going suffer immeasurable with the growing rampant greed. The bottom line in our programming ie, me, mine and money, and I want, I want, I want. They have taught us this over the decades and WE HAVE TO FREE ourselves, like our forefathers from the enslavement by the megarich in Europe. We working on a project where, as community where we will build the houses and do social activism to aid in obtaining funding, including able bodied srs, taking in a homeless child, etc. WE DONT HAVE TO BE CONTROLLED BY CAPITALISM WE CAN LIVE VIRTUALLY MONEY FREE IF WE RETURN TO COMMUNITY and it way better havng real friends as neighbors like in the old days. Would like to see pictures of your home. Also, interested in location. Sounds like what my husband and I have been talking about. We like warmer climates. Check out cornerstonetinyhomes.com for info on places in Florida the welcome tiny houses, and pictures and videos of some of their homes. I would like information on locations possible to live in a Tiny House. I would like it to be a park setting with Pool and clubhouse if that is possible. You are so on point about everything you’ve said. I see now that the average is $30k-$60k. That’s still a lot of money compared to the beginning costs. I am so tired of being messed over by contractors–I just give up. I’m glad I found this website. Glad to know you’re out there!!!! Well, Ive become downright activist!! Remember back in the day when there was activism, which there so isnt now as we’ve all been so dumbed down and distracted with busy, busy, busy. Our kids dont have a clue about taking actions as the money mongers have just drowned them in buy, buy, buy. Gawd!!!. Hey if ya wanna get out of the heat, and live a free life, come on over to Portland, heres what Im working on; sunrisinghome.com. Oh, ya and a note. Ive been following tiny housing since its inception and can tell you……see this is how the capitalist programming works. The average house was under $1,000, then moved up to 3-6 K, then up to 10-15K. See this is how we are programmed. We want nicer and prettier, and more side things, and more and more and more. Now they are running the cost of an average home of 30 yrs ago, ie. 30-60K. So in our tiny home villiage (sunrisinghome.com) there is a requirement to join. You must be willing to deprogram yourself from capitalism, otherwise we are just recreating the capitalism that reigns and keeps giving money to the money mongers. Our community will be about eliminating most of our money needs and focus and return to community, before we are all left in a state of poverty and struggle. If that’s the case, those flimsy, 5th wheels and other travel trailers should only be 8500$ or less, eh? Totally and absolutely correct. Those laughing all the way to the bank are the same laughing all the way to the bank on everything else in this economy. Design? Doesn’t seem that complicated. I have just discovered the ” Senior Planet “. I am in the uk and am negotiating to part -buy a housing association apartment that would qualify as a tiny! Your article is very inspiring as are the rest of your web pages. Love this idea But tough with animals. google macy miller. take a good look at denver, 2 kids and 1 husband. denver is just a small puppy. 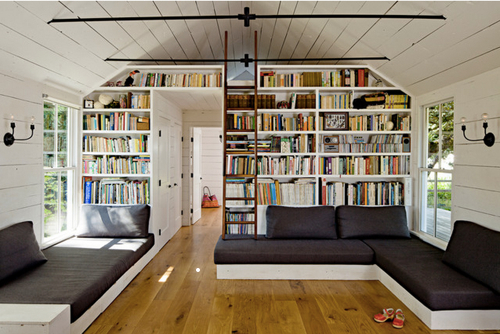 There are many blogs and websites dedicated to ideas for decorating the interiors of tiny houses. Some of those listed above may help, Ed. Or at least be a starting point for surfing the net for more info. The website, blogs and Facebook pages listed at the end of the article should provide lots of information for you. Thanks for your interest, Iva. Is there any information about high rise retirement communities with services for middle class seniors in New York, or how one goes about creating one? I like the idea but for me a “tiny” house would be one under 1500 square feet and still be environmentally friendly and sound. I actually built one in the 80’s which i still have and it’s very economical, beautiful, cost efficient and easy to run.